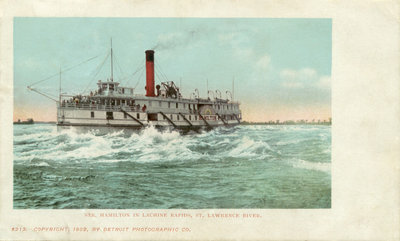 Coloured postcard of the Richelieu and Ontario Navigation Company steamboat HAMILTON (ex MAGNET) as it runs the Lachine Rapids of the Saint Lawrence River. This and a companion photograph of the HAMILTON can be seen in the Detroit Publishing Company site at the Library of Congress. Undivided back. Postmarked "Parkhill Ont. 30 Apr 1912"
"St. Hamilton in Lachine Rapids, St. Lawrence River." "5213. Copyright, 1902, by Detroit Photographic Co."
Reverse: "Post Card" "This side for the Address"